You knew it had to happen sooner or later. I mean, the poor boy was doomed the first time I put a pink blanket around him and stuck a pink pacifier in his mouth! I painted Zack's toes today! How could I resist when he was begging to have his nails done. Lila said she picked out a "boy" color (which was a light pink/purple color that you can't even really see) and when I was painting it on his chubby toes she said in a reverent whisper, "it's gorgeous!" And gorgeous it is, my little man Zack!! Good thing this little guy is ALL boy! Johnny wasn't home when this happened. I don't think he'll be too mad though. After all, Zack wants to grow up and be just like his daddy. Painted nails and all! 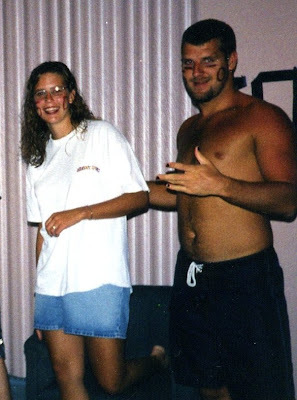 This picture was taken at the beach in 1998 (before Johnny's mission). Johnny's nails are painted black in honor of his mom's 50th birthday. too funny. i'm fairly certain brad would NOT be happy if i did that to our boys. Love it! I think it is cute when little boys have their finernails and toenails painted! How cute! Ahhh, well, I guess it is okay if you promise not to make it an everyday event! :) Cute toes. Poor Zach...if you ever need a break from all the girls you can come visit us. We'd love it! I must say I just want to try some mascara on Josh's amazing lashes. And you know Ben...would not be impressed. ohh i love those little toes! how cute!